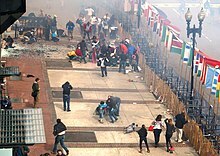 Do you know the Boston Marathon explosion? I did it. Tamerlan Anzorovich Tsarnaev (21 October 1986 – 19 April 2013) was a Kyrgyz terrorist who carried out the Boston Marathon bombings in April 2013. These two mass murders were not the tip of the spear of a new invasion of al-Qaeda terrorists. These were two dysfunctional angry young men. Had about eight bullets in him and he was still fighting us... The only thing I had was my empty gun and I pistol-whipped him. I was trying to knock him out. I hit him as hard as I could, 10 or 12 times, couldn't knock him out... I only did it because I thought we were gonna die. I mean, truly, thought we were gonna die. He came charging up the street, shooting at me... So we're about six feet apart when he ran up that driveway, and he was shooting at me and I was exchanging gunfire with him... I'm lying there and I saw the front wheels go over Tamerlan. I saw him bounce up underneath the carriage a couple of times. I saw him get hung up in the rear wheels and get dragged 20, 25 feet... All we saw was taillights at that point. He put a shame; he put a shame on our family. The Tsarni family! He put a shame on the entire Chechen ethnicity!